Driving a bookmobile is one of my dream jobs. It would be so fun and satisfying. It would be like bringing Christmas gifts to people everyday. 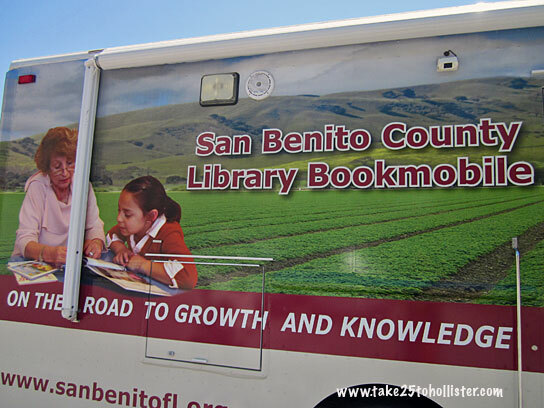 For more about the San Benito County Library Bookmobile, click here. 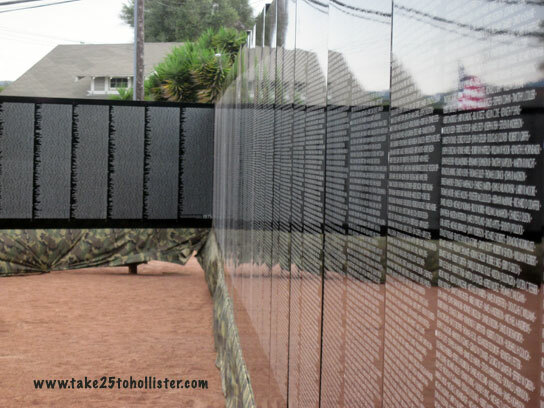 The Moving Wall, the replica of the Vietnam Veterans Memorial (also known as The Wall) in Washington D.C., is on display at Dunne Park, on Seventh and Powell Streets. 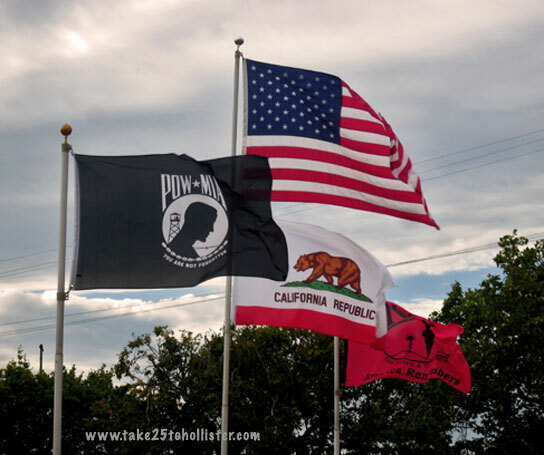 It's open for free viewing 24 hours a day during the Hollister Freedom Rally. Completed in 1982, the Vietnam Veterans Memorial was built to honor the military men and women who served within the combat zone consisting of Vietnam, Cambodia, Laos, and other coastal areas. 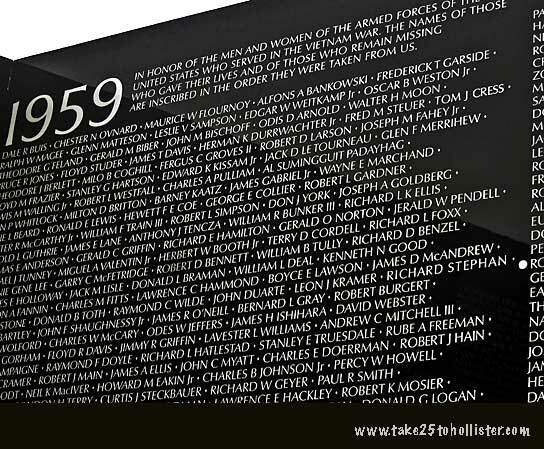 The names on the wall are the 58,272 military personnel who were killed or remain missing in action since 1959. For more details about the memorial, please click here. The Moving Wall was created to bring the memorial to people who may not be able to visit the actual one in Washington, D.C. The replica is half the size of the memorial. It has criss-crossed the United States every year for more than 30 years. 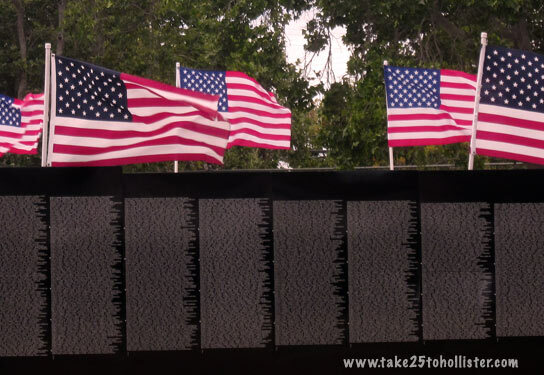 For info about the Moving Wall, please click here. 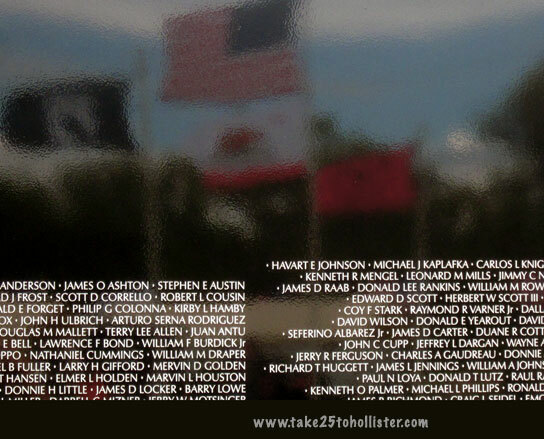 John Caldwell wrote a wonderful article in BenitoLink.com about The Moving Wall coming to town. It includes an interview with local veteran Bernie Rameriz who remembers the seven Hollister men who were killed in action and are noted on The Wall. To read "A moving memorial to Vietnam vets comes to Dunne Park", please click here. 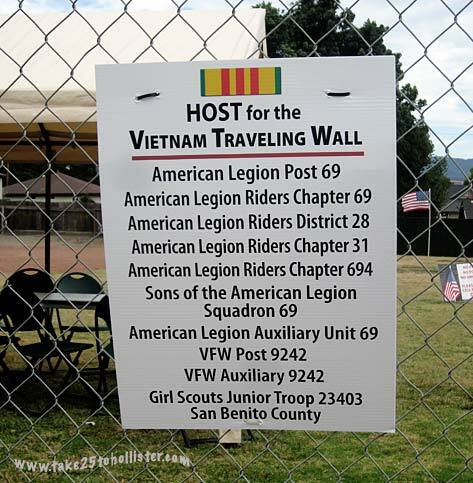 During the Moving Wall's stay in Hollister, it is being hosted by the following groups. Thank you for sponsoring its display in our community. 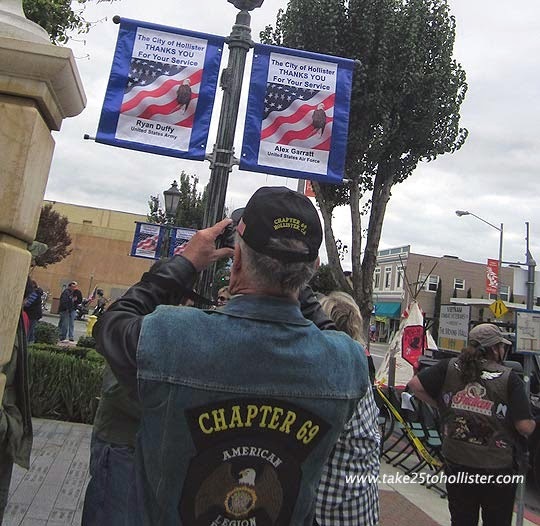 Lined around the Veterans Memorial Building and nearby streets in downtown Hollister are signs honoring local U.S. military men and women currently deployed overseas. The signs went up this past Veterans Day. I'm linking up at the weekly meme Signs, Signs. To check out posts by other bloggers around the world, please click here. 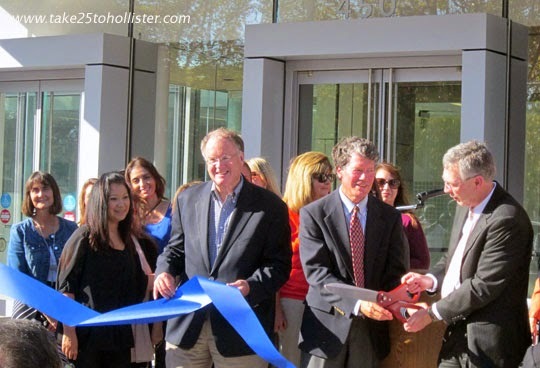 Last Friday afternoon (October 10), the California Superior Court of San Benito County held a public dedication of its new building on Fourth Street. 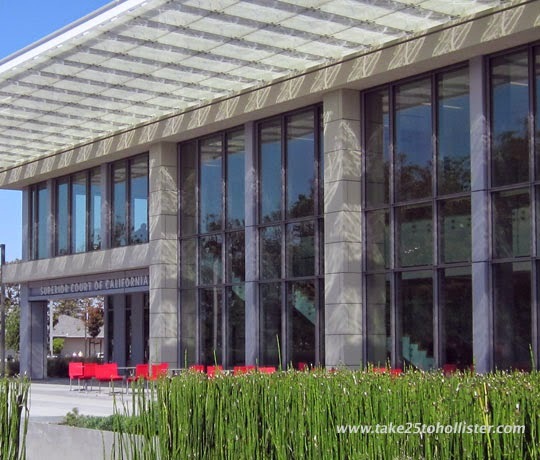 The beautiful state-of-the art two-story courthouse was built on the original site of the home of William Welles Hollister, for which the city of Hollister was named. Hon. Steven Sanders (Presiding Judge of the Superior Court of San Benito). Holding the ribbon, to the right of Judge Tobias, was U.S. Rep. Sam Farr. Officials speaking at the ceremony reflected the collaborative effort at all three levels of government to ensure the much needed new courthouse was built. U.S. Representative Sam Farr, State Senator Anthony Canella, State Representative Luis Alejo, San Benito County Board of Supervisors Chair Jerry Muenzer, and Hollister Mayor Ignacio Velazquez all gave brief speeches. 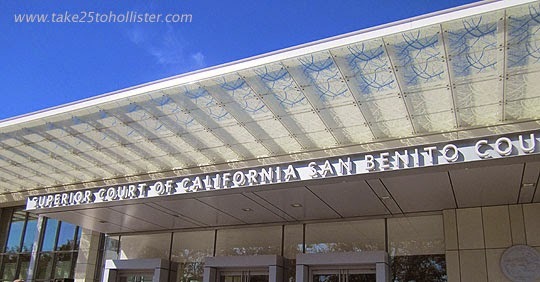 California Supreme Court Chief of Justice Toni Cantil-Sakauye was represented by Judge Brian McCabe, Presiding Judge of the Superior Court of Merced County. 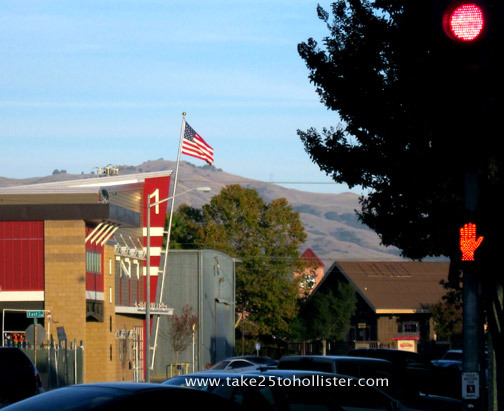 What a perfect way to end this week's theme: Red in Downtown Hollister, don't you think? Do you know where the local American Red Cross office is located? 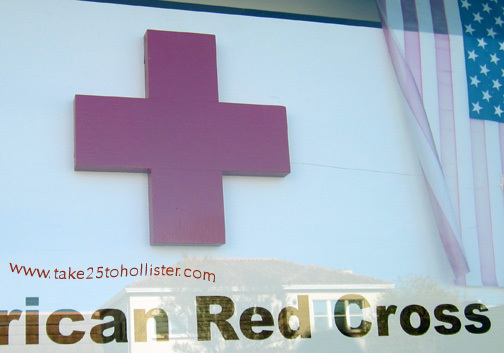 The Hollister American Red Cross office is part of the Monterey Bay Chapter. The local office is at 357 Fifth Street, next to the City Hall. It's open Monday through Friday, from 8:30 a.m. to 4:30 p.m. 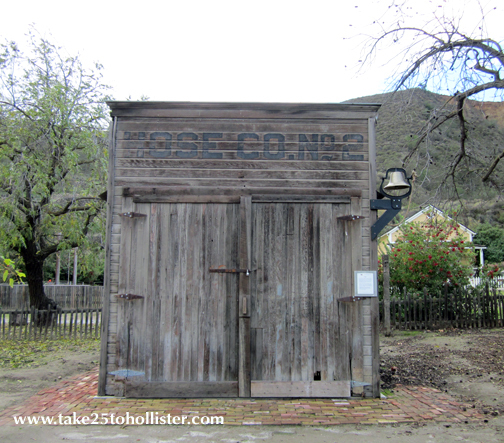 In 1875, the young town of Hollister established a fire department that consisted of 69 volunteer firemen. The fire department created two hose companies and one hook and ladder company to serve the town as well as the surrounding area. The hose barns, or fire stations, were built near the north and south borders of Hollister where fires were likely to range the most. Hose Cart #1 was put up on North Street, while Hose Cart #2 was erected in Swope Alley. Until a few years ago, you might've stumbled upon the small wooden fire station #2 as you wandered through Swope Alley. Today, you can view Hose Cart #2 at the historical village in the San Benito County Historical and Recreation Park, just south of Tres Pinos on Highway 25. For more information about the historical village, check out this page at the San Benito Historical Society Web site. Want to read some more history of the establishment of the Hollister Fire Department? Here's a link for you to do so, which is at the Hollister Fire Department web page. 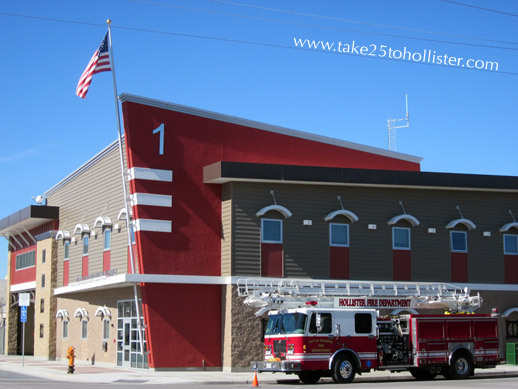 And, for a glance of the today's fire station, head over to this link on Take 25 to Hollister. Have you seen the new fire station at Fifth and Sally Streets? It's beautiful. From afar. From up close. Look at it from all sides when you have a chance. 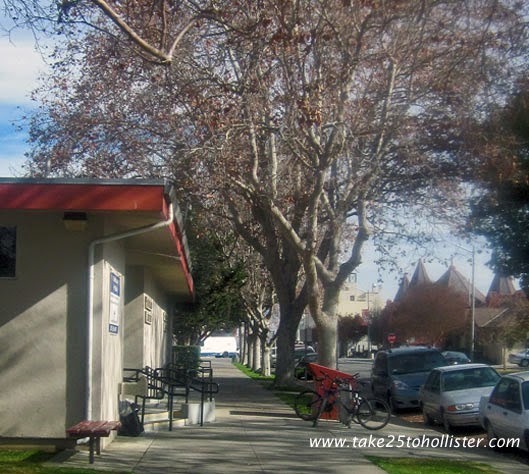 By the way, did you know that the Hollister Fire Department is going to be 137 years old on December 27?